Choosing the right divorce attorney in South Africa? The Violent Femmes knew a thing or two when they sang, “Breaking up is easy to do. I break up every time I break up with you.” Nobody embarks on married life with the intention of filing for divorce down the line. Yet two out of three marriages will fail. And it is one of the most traumatic experiences you can undergo apart from the loss of a child or life partner. In fact, divorce is a sort of death. It is the death of hopes and dreams, of the future you imagined for yourself. Even in the best case scenario, when both parties are in agreement about separating, there is still sadness and a sense of failure. More often the break-up of a marriage is painful, bitter, and traumatising. This is when the legal process can seem so completely at odds with the life experience. The law deals in hard facts and evidence. Your marriage was built on love and trust and compromise – soft assets. How can someone trained in the former help you to dissolve the latter? The Hollywood image of the ball-breaking lawyer negotiating to screw one party (usually the husband) out of as much as possible is just that…a Hollywood image. It may happen where considerable wealth is at stake, but the majority of divorce cases involve ordinary people who are far more concerned about custody and access arrangements for the children than who gets the Bentley. 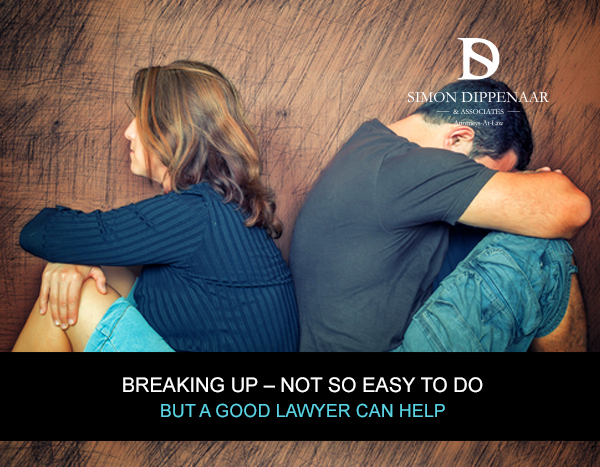 So a good divorce lawyer is not only skilled in the law … that goes without saying, but is also a good listener, sensitive to what is not being said, and discreet and unshockable when faced with intimate information … in other words a good counsellor. A good divorce lawyer is mindful of the client’s budget and doesn’t run up the bill unnecessarily. So a tearful client may be offered tissues and a listening ear; but the attorney will gently direct the consultation to the business at hand. One recently divorced man commented, “I used to keep one eye on my watch to make sure our meetings didn’t run past the hour, because a minute into the second hour meant a bill for the entire time.” Less scrupulous lawyers may invite you to bare your soul while you are run up a bill you may not be able to afford. A divorce lawyer needs more than soft skills and good time management. There are times when it’s necessary to be assertive and firm on the client’s behalf, and sometimes with the client. When people are hurting they are not always rational, and may make unreasonable demands of those who are helping them and especially of those who have caused the hurt. A good lawyer provides the reality check, for example if one party tries to deny the other all access to children. This is where the ‘hard’ law comes in handy, as well as skill in mediation and arbitration. The law makes it easy to tell a divorcing client what the other party’s rights are; good people skills make it easier for the client to hear. And a good lawyer must be resolute when it comes to safeguarding the client’s interests – and those of any children involved. Good negotiating skill and flexibility mean agreement is reached as quickly and painlessly as possible without compromising integrity. Fore more about our approach click here and here. Personal recommendations matter – View Google Business Reviews here. So how do you find this legal paragon? That old stand-by, word of mouth, is invaluable. You probably know someone who is divorced, and quite possibly even someone going through a divorce right now. Ask them about their experiences. What did their attorney do that was helpful? What aspects of the process were the most stressful? Reflecting on these points will help you to determine the qualities that matter to you as you seek counsel for this life-changing event. You can ask for a recommendation but remember, what’s right for one person isn’t always right for another. Don’t be afraid to interview a few ‘prospects’. Over the next few months you are going to see a lot of the person you select. You need to feel comfortable and cared for. Many lawyers will offer one free consultation. Ask questions. Make sure you feel you can work together. This relationship will determine your future – how the children of the marriage are cared for, the financial settlement, etc. It will never be painless, but you want safe hands helping you through the pain. Consider this when choosing a divorce attorney. Simon Dippenaar and Associates Inc. are experienced family law practitioners. They understand what you need in this trying time. Simon and his expert team can guide you through the process, recommend the best route for you and your circumstances, and ensure you close one chapter of your life with the strength to begin a new one. Speak to Simon now about how we can help you and your family. For more information on types of divorce in South Africa, read here. To learn how mediation can help you, click here, and here. For information on counselling through divorce, click here. This entry was posted in Choosing a divorce attorney and tagged Choosing a divorce attorney, Choosing a divorce lawyer, How to choose a family law attorney. Bookmark the permalink.